Woah! I realised today I’m almost caught up with the Splendid Sampler quilt, like I’ve only the most recent one outstanding at the moment! Not only that but I’ve sashed ten and even better, I’ve quilted another ten! 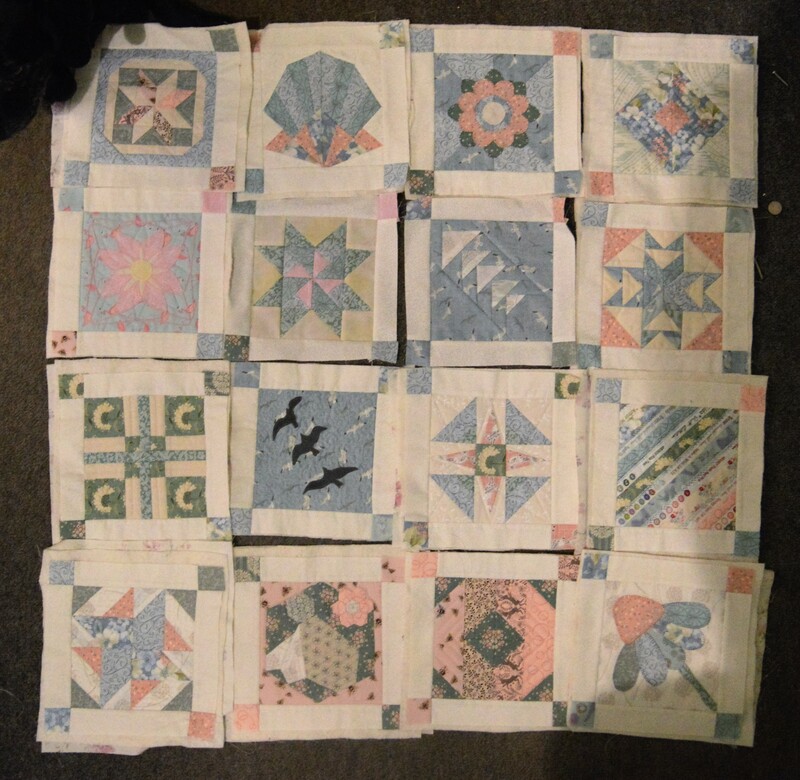 I’ve done quite a bit on my quilting blocks over the last few weeks, mainly because I’ve a few big projects on which I need to finish before I start a bigger dress-making project, namely decorating (nearly done for now! ), curtain making (still to hem) and cake decorating (a diamond wedding cake for Saturday and a two tier wedding cake for a week on Saturday!!) The cakes are starting to stress me a bit! The little quilting blocks are ideal for when I need a couple of hours relaxation in the evening. I’ve started doing the quilting and sashing in a bit of a production line, I’m finding it works better that way. I cut several 1.5″ strips for the sashing and stitch four blocks at a time, I’ve a bag of 1.5″ squares cut from different fabrics for the cornerstones. I’m trying to have at least a couple of the corners from the fabrics in each square, whenever I need to cut one in a fabric, I cut at least four and pop them in the bag so I have quite a few pre-cut. I similarly found it is easier to spray-baste several at once, I’m using leftover wadding but many of the pieces are big enough to fit 6 or 8 blocks on, so I’m spray-basting the wadding onto a similar sized piece of backing fabric and then basting the blocks on top. If I’ve just got 20 minutes to spare, I can choose a simple block and quilt it. 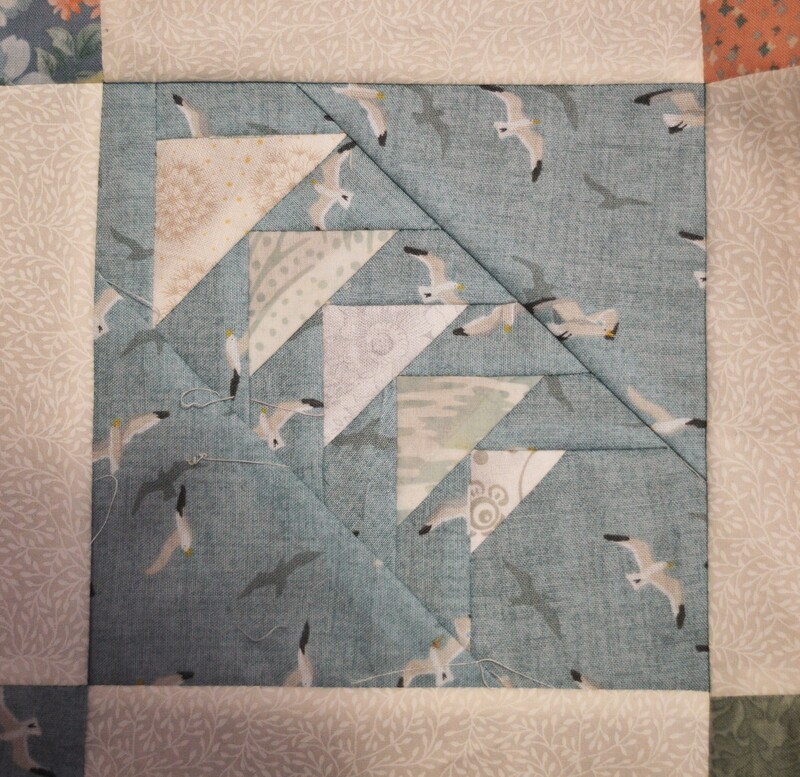 I’m pretty pleased with my quilting so far, I’m starting to get a bit more adventurous and not just do stitch in the ditch, though it does depend on how much I like that particular block! I tend to play it safe on those I really like! 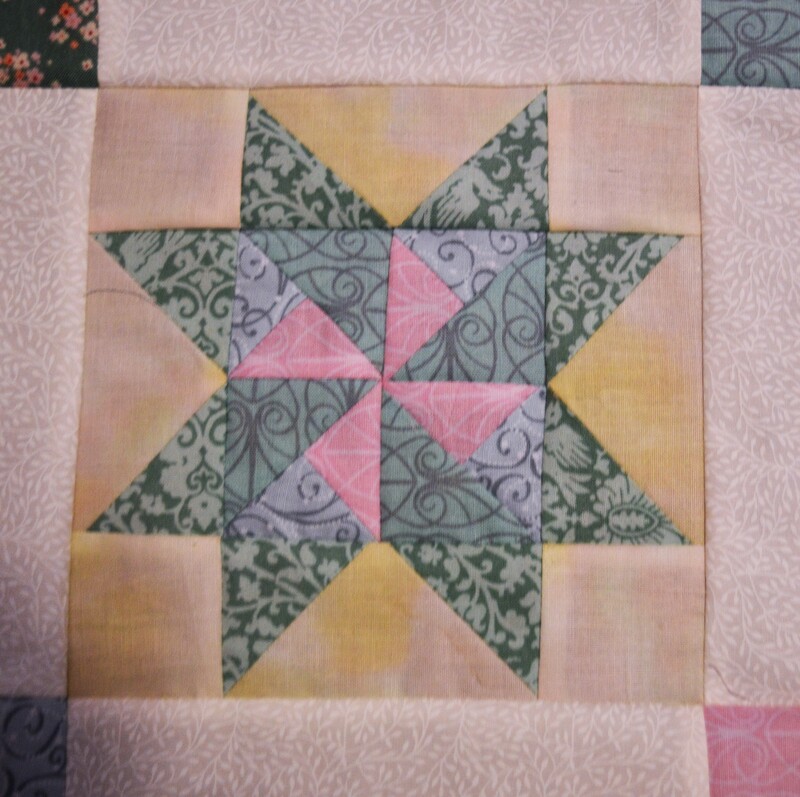 I’m following Quilt It Now and finding Dianne really helpful for ideas on how to quilt these blocks. 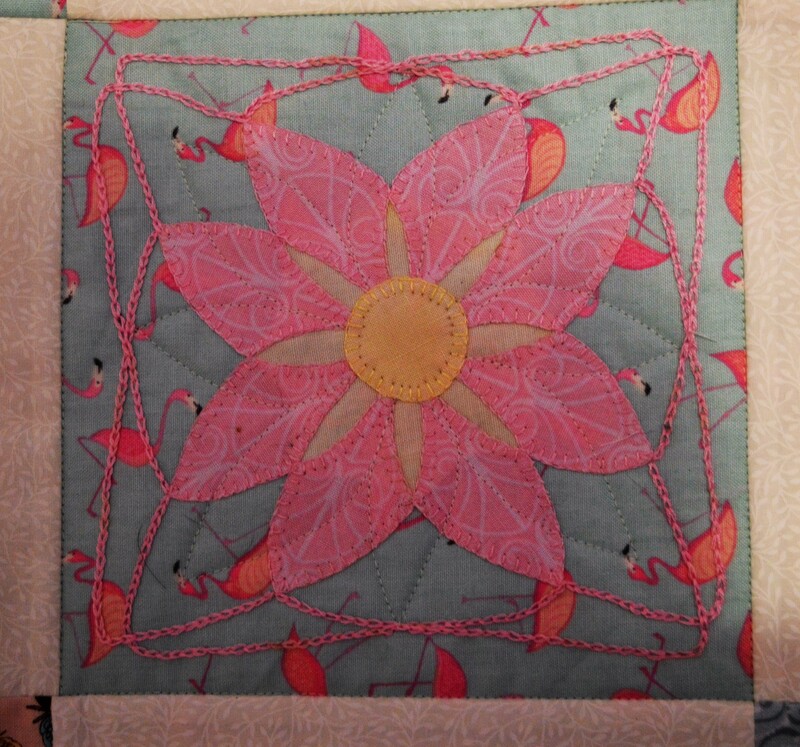 I’m really pleased with the ‘Flamingo Flower’ block, as I call it, I didn’t want to quilt across the embroidery so I quilted another set of petals. I’ve finished a couple of applique blocks. I think the little house is lovely, it’s called ‘At Home Anywhere’ it is meant to have another window but I decided to make mine into a birdhouse, I’d have lost the three birds if I added the window! 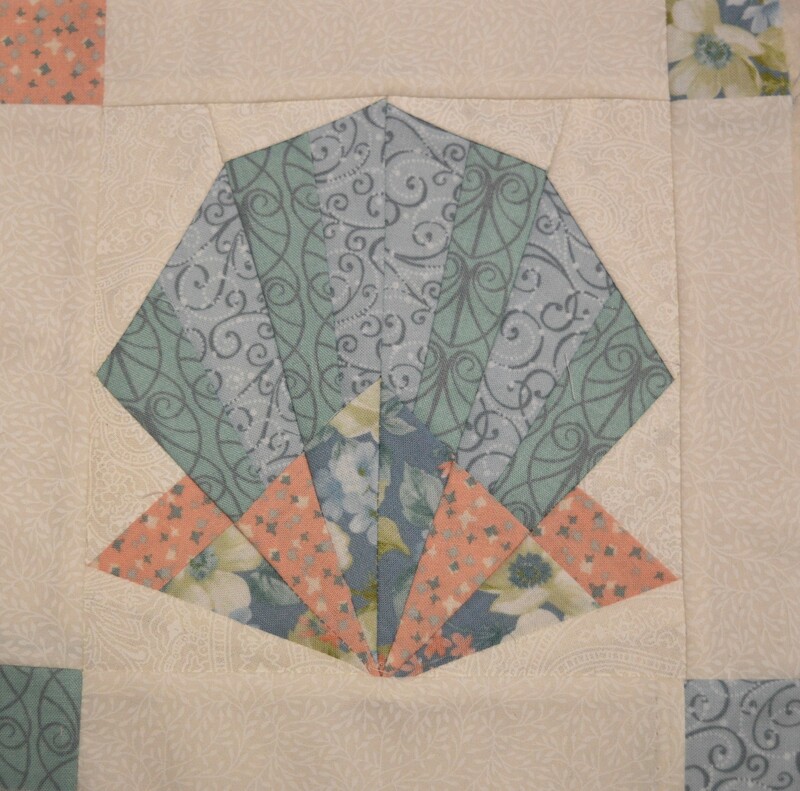 I’ve also made two foundation paper pieced blocks. Much to my surprise I quite enjoy these blocks now, though the shell one was quite complicated, I ended up labelling the paper pattern as to which fabric to use. Kate from Tall Tales from Chiconia helpfully suggested using a thick pressing pad made from several layers of batting, whilst mine is a temporary folded wadding mat, it does seem to have helped with the finish of the paper pieced blocks. 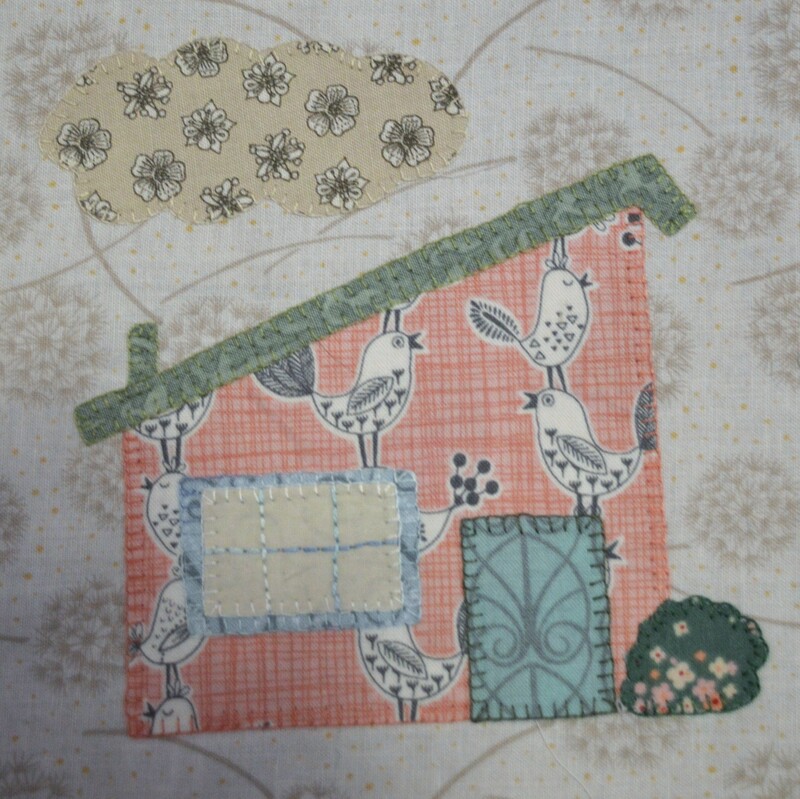 As soon as I saw ‘Homeward Bound by Kelly Liddle I knew I wanted to use the seagull fabric. I’m really pleased with how this one came out. I’ve completed fifty-eight blocks so far, this is a selection sashed and some quilted, together with my dog, Zac, doing a sneaky photo-bomb! I’m linking up with Young Texan Mama for Sew Cute Tuesday, why not have a look what everyone else is creating. This entry was posted in embroidery, Quilting, Serendipity, Splendid Sampler Quilt and tagged My Splendid Sampler, Quilting. Bookmark the permalink. Hearty congratulations for keeping up with this project. Your ideas to work a few minutes here and there, and portioning up things in baggies are really paying off. I need to remember your tips, and use them. Thank you for setting such a great example! I don’t quilt, but there are good tips here and I love your sampler. Thanks Ann, I’m really pleased so far, though it’s going to make a pretty big quilt!